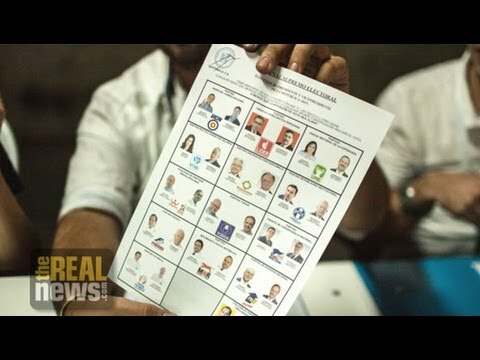 After months of protests leading to the resignation of Guatemala’s former president Otto Pérez Molina, Guatemalans headed to the ballot box to elect their next leader this past Sunday. There are 7.5 million registered voters in Guatemala, and according to the Organization of American States’ observation mission the elections were a success, with 51.8 percent of eligible voters participating. But with no clear victor winning the majority of the vote, three candidates will most likely be squaring off in the next round. Now joining us to help us understand who’s who is our guest Andrea Ixchíu. She’s a journalist with Prensa Communitaria, and she joins us now from the country’s capital, Guatemala City. Thank you so much for joining us, Andrea. ANDREA IXCHIU, JOURNALIST: Hello, good afternoon to everyone, it’s a pleasure to be with you. DESVARIEUX: Great. So let’s just start to unravel who these candidates are. Let’s start off with Jimmy Morales, who won most of the votes but not enough to avoid a runoff. In the American press, Andrea, he’s sort of portrayed as this TV comedian that came from really poor background, became a small business owner, and really pulled himself up by his bootstraps, as they say here in America. What interests does Jimmy Morales represent, and which voting bloc supported him in this election? IXCHIU: Well, Jimmy Morales as you said, he works on TV. He’s a comedian. But he’s surrounded by a very, very dark military elite. The people that represent an organization of–it’s named [inaud.] which has a lot of people that was part of the genocide and the war crimes in the early ’80s. All of them reunited in this organization to take care about old legal demands against military commandos, and they were putting a lot of pressure over the media and public opinion in between the genocide case. They do protests to defend [rielsment] and all of them are [related] in some way to the war crimes. So as you can see, maybe Jimmy Morales has shown himself as a poor candidate, like as a fresh new face in politics in Guatemala, but he’s surrounded by a very old military elite that has been leading in other spaces. They funded in the early ’70s the party called the [MLN], which was the political party that named itself the political party of organized violence. Which is also the same political party who was hosting the new president of Guatemala, Maldonado Aguirre. So we can see those networks moving and reorganizing themselves to keep themselves in power, and especially to protect themselves against trials for the human rights violations during the war. In another fact we have seen how the biggest media in Guatemala was supporting Jimmy Morales on his last days of campaign, especially because all of them begun a big campaign against one of the candidates, the second-placed one, Manuel Baldizón. So they start pushing Jimmy Morales in the top of a lot of public opinion programs and pushing him to, as the possibility to be [chosen]. So we have seen that also, a part of all that strategy. The biggest media and also the military person that is moving around him. DESVARIEUX: Great. Let’s talk more about Manuel Baldizón, who you mentioned. I also want to bring up him as well as First Lady Sandra Torres, who both had slightly over 19 percent of the vote. Now, these two candidates most likely are going to be going against Mr. Morales. What interests do they represent and how do they differ from Mr. Morales? IXCHIU: Well, we say that they just represent different interests in the way they do business, and which part of the economical elite that they do represent. We can see, as Jimmy Morales, part of the economic elite that is part of the military forces, we can see Manuel Baldizón as part of the elites, the organized crime in Guatemala. A lot of people have denounced him as being part of criminal structures connected with drug cartels and also paramilitary forces. Then also we have connected Manuel Baldizón during a lot of investigations that had been posted by a lot of other media in Guatemala as also part of a lot of small businesses that are connected to bus travel agencies, and new economic powers. So he’s not represented the traditional economical elite. As then, Sandra Torres, with her as a vice president, one of the demands that belongs to the traditional economical elite. So in some way we have seen how the right power in Guatemala the elites are reorganizing themselves to be part of the government, and that’s what we are seeing. There’s no opposition force. There’s no, even a revolutionary movement. DESVARIEUX: I’m so glad you mention that, because to me it sounds like there isn’t much of a difference between these candidates. They’re, like you said, represent the interests of the elite, but there was just so much frustration out there on the streets, and it seems like it’s quite palpable in Guatemala, that people are sick of the status quo. So why do we have three leading candidates who all represent that status quo, and there hasn’t been a real challenge to them? Did voters not have any strong challengers outside of this political elite in this round of elections? IXCHIU: No. I think that’s one of the saddest parts in all of this. The protests were demanding not just a resignation of Otto Pérez Molina and Roxana Baldetti, the [march] and a lot of the protesters were asking for some political reforms in some of the most important laws in Guatemala that can actually change the way that elections happened. That were supposed to be changed, not just the political parties just changing the rules so more popular forces and movements can participate in the elections. But that doesn’t happen. So we have seen that it is true that there’s, like, a success in the name of, the observers named this election. But we haven’t seen, too, how the people that doesn’t go to vote, or that [inaud.] vote, or they leave their voting blank, affect these elections. Like, we have seen there’s 8 million people in Guatemala that has been registered to go vote. But just close to 4 million went actually to vote. So that means that there’s a big population in Guatemala that doesn’t go to vote, and that is not happy with these elections and the way they came out after all these political scandals of corruption and, well, the saddest part is that we don’t have enough time, since we have seen that there was a legal possibility to change the rules during April 25 to September 6. And people start struggling to make the Tribunal Supremo Electoral to change the elections times and dates, but they didn’t want to change it. And they also received a lot of pressure from the U.S. embassy. DESVARIEUX: So Andrea, hold on to that thought because in Part 2 I really want to delve into the role of the United States in all of this. Andrea, thank you so much for joining us. IXCHIU: Thank you so much for this interview. DESVARIEUX: Welcome back to the Real News Network. I’m Jessica Desvarieux in Baltimore. Now joining us to help us unravel what actually took place in Guatemala’s elections this past Sunday is our guest Andrea Ixchíu. She’s a journalist with Prensa Communitaria, and she joins us now from the country’s capital Guatemala City. Thanks for being with us again, Andrea. So Andrea, at the end of our last interview we were discussing how essentially the United States’ role in all of this, and I want to drill down a bit and speak to these three frontrunners, as we mentioned. Jimmy Morales, we have Sandra Torres, and we also have Manuel Baldizón. Is the United States favoring one candidate over another? IXCHIU: Well, I think they favor two candidates over another. They are favoring Jimmy Morales and Sandra Torres over Manuel Baldizón, because this last one Baldizón has been arguing in his public campaigns that he’s against U.S. embassy intervention in our country, especially because all of the pressure that the U.S. embassy have put in all the institutions that has something to do with the elections, and also because they have been giving money to a lot of NGOs and also the government to make the elections going, and not hearing the popular demands that we’re asking to prolong the elections to November or December in a way to actually build citizen movement, popular movement that can actually become a political party or a political force that can be putting representation of the popular demands in the new government. DESVARIEUX: So you mentioned sort of the intervention of the United States. Can you speak to specifics? What exactly were they trying to get done? IXCHIU: Well, they have been appearing in public, the U.S. embassy, has been supporting the president when the first mobilizations began, when the [state] came out with all these investigations, people started asking for his resignation. So it was close to April 25 when the U.S. embassy came out with the president in a press conference saying that they are going to defend democracy and the institutions. So then when the [inaud.] came out with all these investigations when they were relating Otto Pérez Molina to the criminal structure named Line, the U.S. embassy was saying that well, we agree that the president had to be removed, and we support citizen demonstrations. So we have seen how they were changing their speech during these past three months, but always mentioning that it was important to keep the elections going and to defend democracy. So we have seen how they were intervening in the institutional commission for the elections, and with giving money to a lot of NGOs to do campaigns in all the media to put in the mind of the people that there was a necessity to keep going with the elections and never talking about building new ways, building new rules, or also supporting the demands for changing the electionary law, that can put some pause to the elections and get passed through, clean out our political system. DESVARIEUX: In your interpretation lay out some of those arguments as to why the rush? I can imagine that if you have some money and you have some means it’s not that difficult to put together a political campaign. But if you were trying to mobilize people, if you were trying to get people power, it can take some time. So for you, you are a journalist but I know you too are very active in your community. Can you speak to that a bit? Why such a rush? IXCHIU: Well, they want to keep the status quo. It’s dangerous for them, like, the popular demands can be heard because behind the popular demands for the resignation of Otto Pérez Molina and also the [suspension] for the election, are all the historical demands of the indigenous communities, the women’s struggle, saying that we don’t want to have more transnational companies evicting indigenous communities, putting the laws the way they want to win trials against communities and implement mining companies and hydroelectrical projects that damage nature. So they want to sustain their business role, and they want to sustain their business in Guatemala. That’s the biggest interest that they have. Like, the new plan for the Prosperidad, the Triángulo Norte plan, and all that strategies and [help] political strategies that the United States and interests that they have here. So that’s why we understand now, as the popular movement, that was the rush to do the elections and not waiting, and giving time so we can put candidates that represented traditional and historical commands. DESVARIEUX: All right, Andrea, really really fascinating analysis. We’d love to have you back on leading up to the elections in October. Thank you so much for being with us. IXCHIU: Thanks for this space.